Russian Hebraist and teacher; born in 1861 at Logoisk, government of Minsk, Russia; educated at the high school of Mohilev on the Dnieper, and at the University of Kharkov. 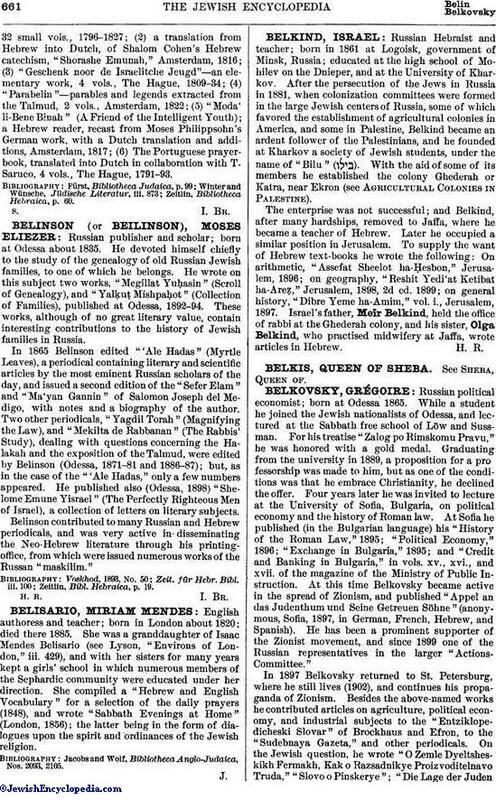 After the persecution of the Jews in Russia in 1881, when colonization committees were formed in the large Jewish centers of Russia, some of which favored the establishment of agricultural colonies in America, and some in Palestine, Belkind became an ardent follower of the Palestinians, and he founded at Kharkov a society of Jewish students, under the name of "Bilu" ( ). With the aid of some of its members he established the colony Ghederah or Katra, near Ekron (see Agricultural Colonies in Palestine). The enterprise was not successful; and Belkind, after many hardships, removed to Jaffa, where he became a teacher of Hebrew. Later he occupied a similar position in Jerusalem. To supply the want of Hebrew text-books he wrote the following: On arithmetic, "Assefat Sheelot ha-Ḥesbon," Jerusalem, 1896; on geography, "Reshit Yedi'at Ketibat ha-Areẓ," Jerusalem, 1898, 2d ed. 1899; on general history, "Dibre Yeme ha-Amim," vol. i., Jerusalem, 1897. Israel's father, Meïr Belkind, held the office of rabbi at the Ghederah colony, and his sister, Olga Belkind, who practised midwifery at Jaffa, wrote articles in Hebrew.